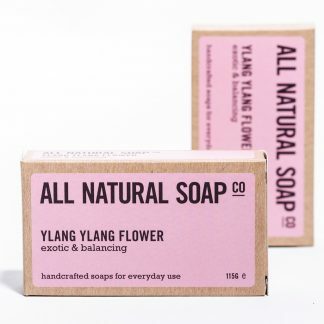 View cart “Ylang Ylang Flower” has been added to your cart. A super-concentrated, power house of a shampoo that promotes a healthy scalp and soft, shiny hair. We use our unique 'extra cold' technique. 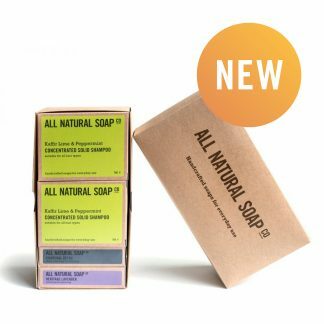 As you’d expect from us, this convenient, solid shampoo really is totally natural (no sneaky SLS in here! ), and is the result of many years’ development. To achieve a winning formula that’s suited to all hair types and water conditions, we’ve expertly blended a whopping 9 base oils with soothing coconut milk; shine-promoting kaffir lime; and a fantastic-smelling essential oil blend that has numerous hair-care benefits. 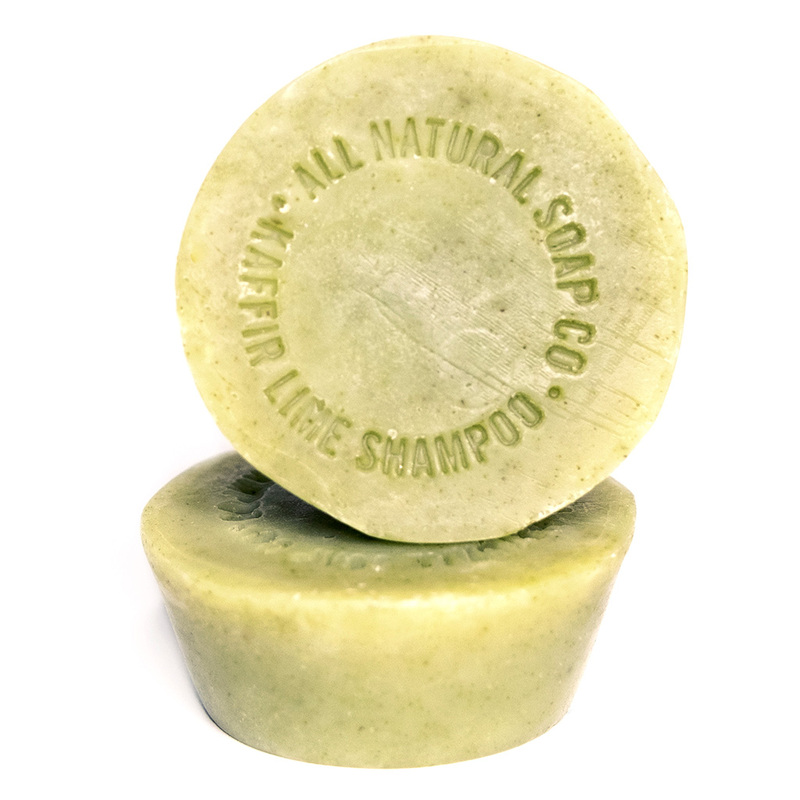 Uniquely, this shampoo is also formulated with equal attention to both hair and scalp, and therefore feels wonderfully refreshing to use; has an abundant, creamy lather; and is surprisingly clean-rinsing even in hard water conditions. The shampoo can lathered directly on the head or ‘hand-lathered’ and the foam applied to the scalp. An acidic final rinse with diluted Apple Cider Vinegar/Lime Juice is an optional final step. Conditioner/Hair oil is optional and unlikely to be required by all but those with very dry hair. Suitable for all hair and scalp types, except very sensitive. A leaflet with more information and full usage instructions will be attached to your email order receipt. Should be suitable for use on colour treated hair, but a patch test is advisable. Those with extra sensitive scalps might like to try our Gentle Shampoo Powder. Each bar weighs at least 70 grams, and measures approximately 7cm diameter at its widest point – it is a tapered puck shape. 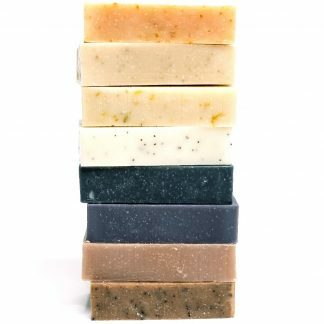 Being handmade and totally natural, our soaps vary a little in size and colour from bar to bar and batch to batch. Packaged in a sturdy, fully recyclable box. 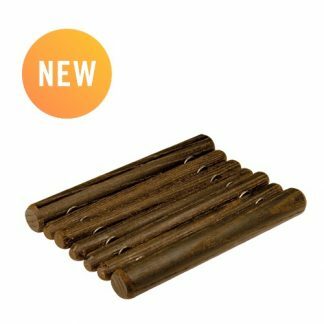 If you require it packaged in a compostable sleeve instead, please let us know in the ‘Order Notes’ on checkout. Gluten Free, Wheat Free, Dairy Free, Peanut Free, Sesame Free, NOT Nut Free *Manufactured in a workshop handling dairy containing ingredients. 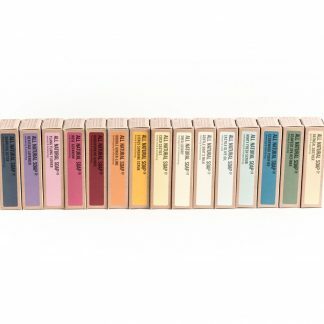 We only colour our soaps with plant, fruit and vegetable materials; and our complex, perfume-like scents are 3 note blends of pure essential oils. 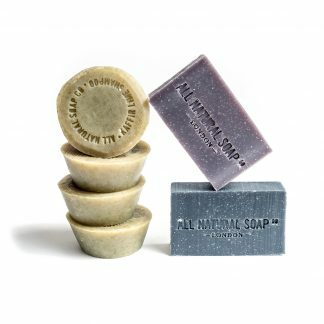 All our soaps are 100% vegetarian, most are also vegan. 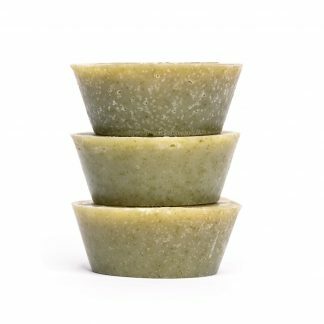 The only soaps that aren’t vegan are our Gentle Goat’s Milk, Oatmeal Soother and limited edition Mint Mojito soap. These contain fresh goat’s milk, bee-friendly honey and probiotic yogurt respectively. 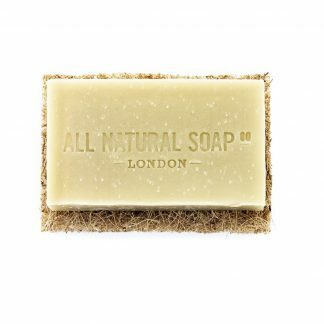 No actual animal parts are used anywhere in our soap range. 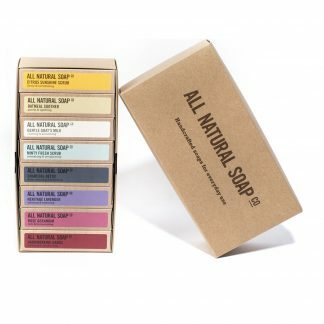 Neither this soap, nor its ingredients, are tested on animals. You don’t need to pick something up to know how much is left, you just see it. Less plastic is also very appealing and the fact is so organic means I don’t need to stress about it. The solid shampoo smells good and works well on my beard as well. Shower looks much more minimalist. I recommend this shampoo to anyone. I have tried a few times to wash using bar shampoo and its always left a waxy feel to my hair. I thought I’d try this though, as they gave me a sample of their shampoo a while back (So I’m guessing they have improved on it). I think you do have to stick with it. You also have to make sure you wash each section of your hair slowly. So it takes longer than shampooing with a bottle, although its worth it. I only wash my hair two-three times a week now, so I don’t mind spending more time in the shower. I followed the instructions-which says to also use vinegar to rinse. You do have to rinse thoroughly, and after my hair was dry, it was lovely and soft. It also felt like I had used some styling products on it-which was good. I cycle a lot and usually in the winter my hair becomes a frizz ball, however there was not much frizz after using the bar shampoo! My friend even commented on how good my hair looked! I definitely will stick with it-you just have to be patient and rinse rinse rinse! A really great shampoo , truly practical having traveled the last 2 weeks , a pleasure to use and really pleased it now comes as 3 in a pack! I tried this shampoo out having used a variety of natural options before, I absolutely love this. Most other natural options have left my hair feeling like straw or too greasy. 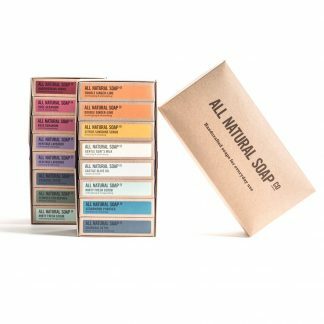 This soap works well enough for me that I do not need to do a vinegar rinse. I am using an adapted version of the curly girl hair method for my wavy hair and using this followed by a sulphate free conditioner is leaving me with bouncy glossy waves. Plus the smell is delicious. I just wish there was a way to buy it in bulk to keep it as energy saving as possible. 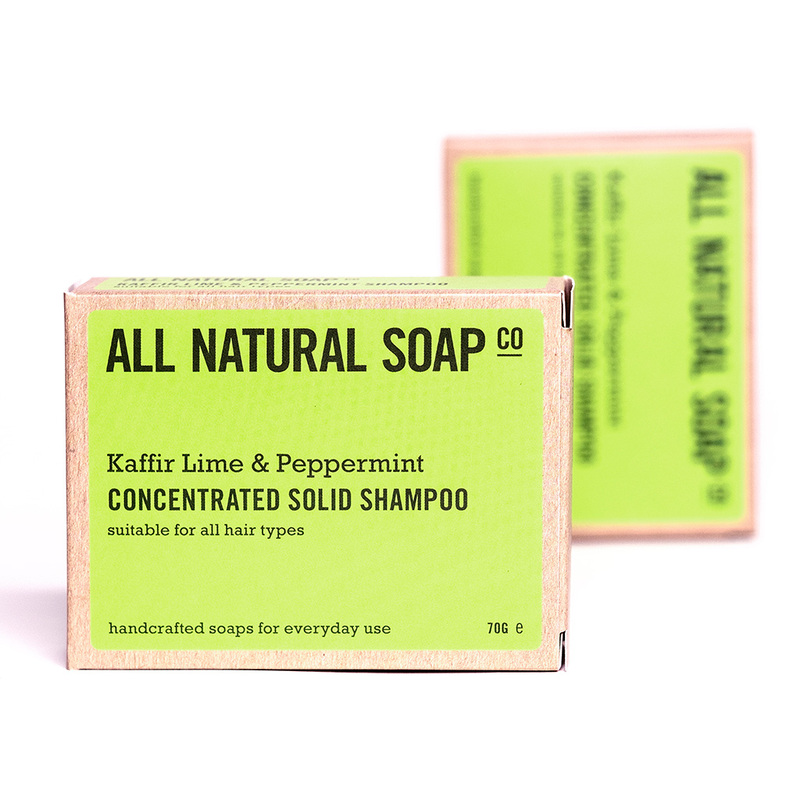 I received my Kaffir Lime and Peppermint Sahmpoo in the mail yesterday. The shampoo smells divine, but more importantly, the shampoo lathered beautifully and rinsed cleanly, leaving me with soft, shiny hair. 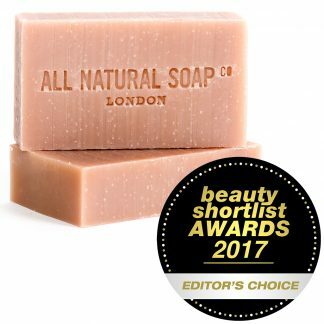 Thank you, ALL NATURAL SOAP Co for making a gentle shampoo that is such a delight to use. AND, for all you travelers out there, since it is a solid shampoo, you don’t need to put it in your quart size liquids bag at security! This shampoo bar is great – it really lathers up in your hair and lasts quite a while if you place it properly in your shower. The smell is great and it cleans hair perfectly. 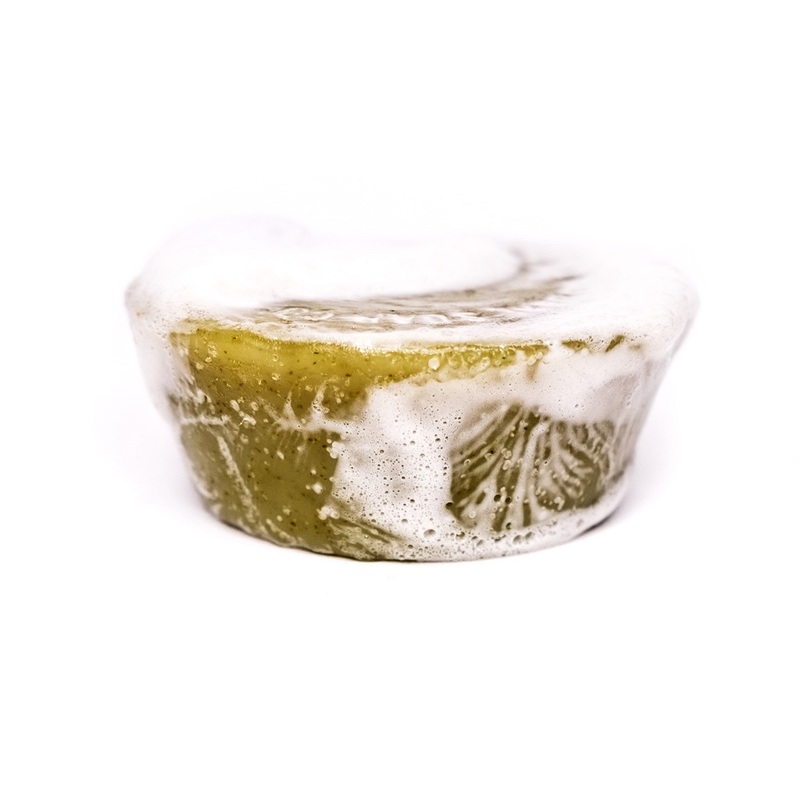 I have pretty hard water here in Germany and was hoping that the shampoo bar will take it well. How was I wrong. Even with an apple vinegar rinse-out advised after use hair still feel greasy. It’s not the kind of shampoo for frizz-free hair neither. But yeah, the smell is nice. Many thanks for taking the time to write a review Elena. Sorry to hear that the shampoo bar didn’t work well for you on the first attempt. If you’ve followed the washing instructions in the leaflet closely and applied a vinegar rinse, then the most likely reason for experiencing greasy hair is that your hair simply needs to adjust to a gentler way of washing that doesn’t strip all the oils (wanted and unwanted from the hair). There is more info on this in the leaflet that came with your shampoo in the FAQ section, but in short this is likely to be your hair reacting to the change from washing with a sulfate-based shampoo, or styled/conditioned with silicone-containing products. 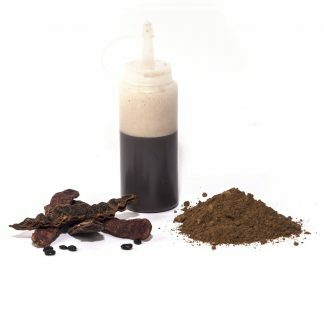 We’ve done everything we can in formulating this shampoo to minimise this possible transition period and this has been borne out during the testing phase of this product’s development. To help ease the transition, you can try thoroughly cleansing your hair with the bicarbonate of soda rinse outlined in the leaflet. Another alternative could be to try our shampoo powder. We have had no reports of needing to go through a transition period with this method of washing. 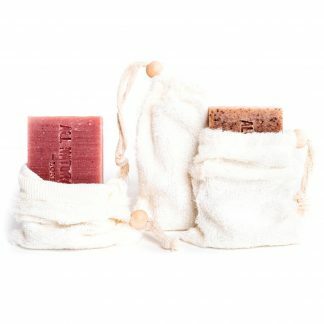 Washing with the powder for a few months then going back to the solid shampoo could also be something to try. 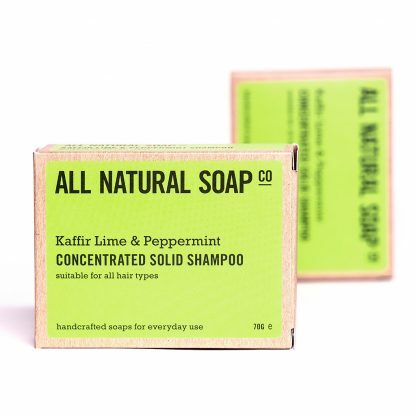 If you’re totally against using the shampoo on your hair again, then rest assured that it is totally fine to use on the face and body, and indeed you’ll hopefully really enjoy washing with it in this way. We’ll follow up with you now via email to see if we can be of further help, and if you have any questions, we’re here.